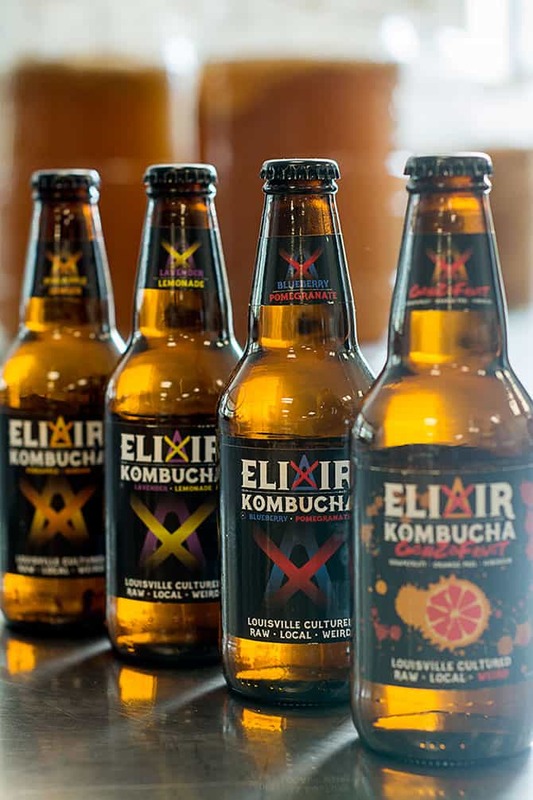 Since the inception of their business Elixir Kombucha in April of last year, Danielle Wood and her husband Corey have followed the same routine. Before “Monday-Brew-Day” begins, Danielle and Corey (bonafide high school sweethearts) meditate and practice yoga together. 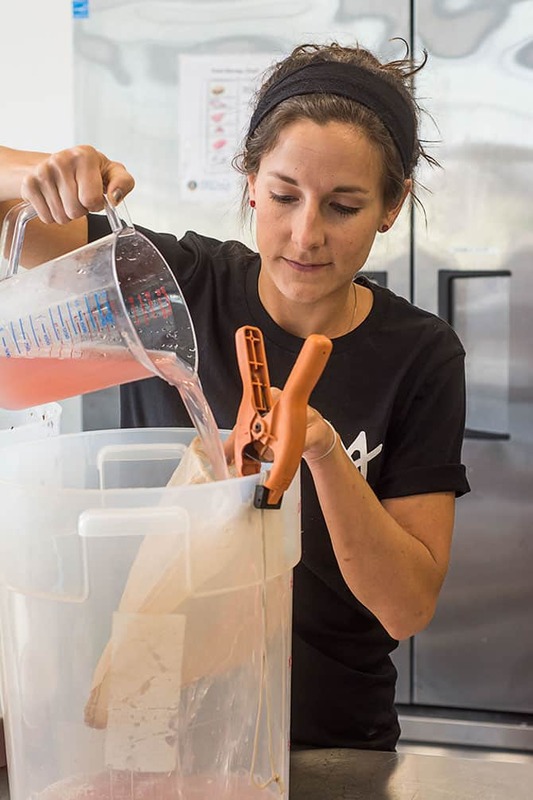 With their minds and bodies ready to channel peaceful energy into their product, a 2,000-year-old elixir known as kombucha, they set off to their facility in Chef Space, a shared, commercial kitchen in the Russell neighborhood available for rent to food entrepreneurs. While brewing, however, Danielle, 29, has a different ritual: she binge-listens to real crime podcasts. “It probably negates all the work I’ve done with meditation, but I love it,” she says with a laugh. Kombucha, known as “The Immortal Health Elixir” or “mushroom tea”, is a fermented beverage typically made from sweetened black or green tea. Although the drink has been consumed in the Far East for centuries, Westerners have recently been drawn to its acclaimed health benefits ranging from cancer prevention to weight loss. The effervescent, slightly acidic beverage is made by introducing a SCOBY (symbiotic colony of bacteria yeast) to sweet tea, which initiates the fermentation process. The SCOBY begins to feed on the sugar and caffeine, releasing carbonation, healthy antioxidants, probiotics, digestive enzymes, b-vitamins, and amino acids like glucosamine. These byproducts are responsible for kombucha’s claims to fame: promoting healthy digestion, detoxification, increased energy, immune system support, and joint health. Danielle, Corey and Ryan are expanding their distribution of kombucha out of state. Danielle drinks two glasses a day from her home brewed kombucha kegerator and swears by the stuff. She was first introduced to kombucha in Knoxville, of all places, while visiting Corey’s aunt. She wasn’t an instant fan. Introducing kombucha into her diet took a little convincing from her husband who began home brewing his own batches of kombucha using a SCOBY he acquired from a friend. “Our first batches were bitter and messy because we were trying to get the fermentation period just right. The SCOBY looks like a gelatinous jellyfish, and it took me about six months to acquire a taste for it,” Danielle explains. Danielle secures a filter on top of a container with kombucha, which is part of the fermentation process. But as the couple perfected their recipe over the next two years, they experimented with adding organic fruit juices and herbs to make the batch more palatable. This is the appeal to Elixir Kombucha: it comes in a variety of flavors like pineapple-ginger and blueberry-pomegranate that taste mildly sweet and refreshing, not as bitter or acidic as the raw product. The couple began sharing their concoction with friends and family over their three to four years of home brewing, and this is how their business began. “It really fell in our laps,” Danielle says of the start of their new business. Corey’s sister suggested to her local juicer, The Weekly Juicery, that they should try her brother’s kombucha. After sampling his product, they offered to carry it in the store if he became an LLC. Corey, Danielle, and close friend Ryan Cheong rented a production space at Chef Space and began taking shifts brewing kombucha and self-promoting. A year later, the product is now sold in over 30 stores and cafes including Whole Foods and all Rainbow Blossom stores. It was recently picked up by a distributor that is taking the product out of state. They take turns brewing and slinging their kombucha at farmer’s markets as their small business grows. 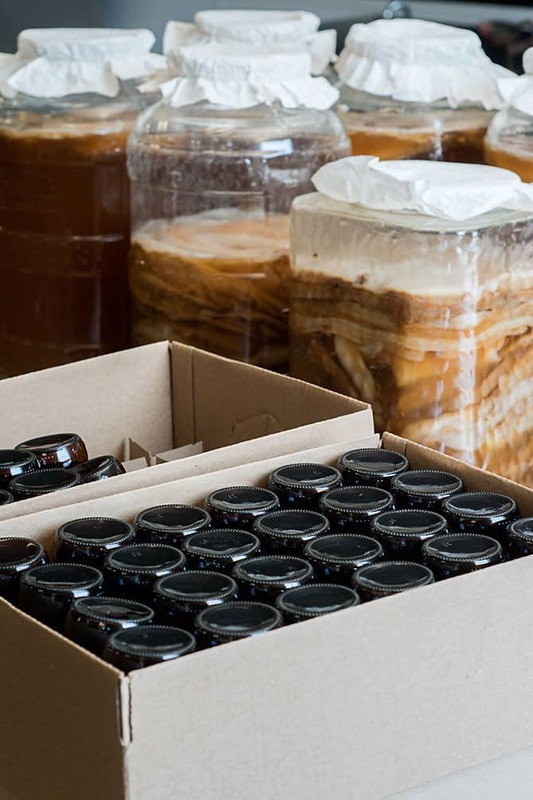 The containers in the background contain several SCOBYs. The three partners haven’t left their day jobs yet. Danielle is a traveling biometric screener for insurance companies, Corey is a nurse, and Ryan works in the food and beverage industry. They do have a timeline for bringing each other on full-time. Until then, Danielle and her partners will continue to be flexible and balanced with a little help and guidance from their ancient elixir, intentional meditation, and podcasts. The 4-Hour Workweek by Timothy Ferriss. A guide for readers to live more and work less through efficiency strategies for entrepreneurs. 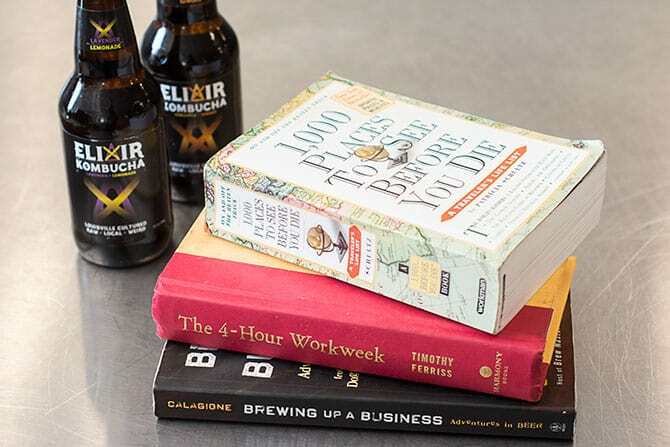 Brewing Up a Business by Sam Calagione, founder of Dogfish Head Brewery. Silicon Valley — All three of the partners have tuned in to this show due to its entertainment and real-life connections to running a startup. Danielle takes notes about the business side, but the comedic value is what keeps her watching. Full Frontal with Samantha B. Last Week Tonight with John Oliver — “Satire news doesn’t bog me down like the talking heads on 24-hours a day in mainstream news. I need a little comedic relief from the reality of what is going on,” Danielle says. Danielle listens to the meditation app called Buddhify that she purchased from iTunes for $5. This app leads practitioners through meditation practices geared toward a variety of environments: meditation for sleep, for waking, for travel, for stress, etc. Danielle has been interested in “present state awareness” and mindfulness for over a year (right around the time her business was launched) in an effort to stay grounded and live in the moment amidst the flurry of activity that comes with being an entrepreneur. True crime podcasts such as My Favorite Murder are Danielle’s guilty pleasure. This podcast tells the narrative of a murder with comedic commentary while analyzing the crime. After reading this article, I've become addicted to both the Lavender Lemonade Kombucha and the My Favorite Murder podcasts! Makes the work day fly.